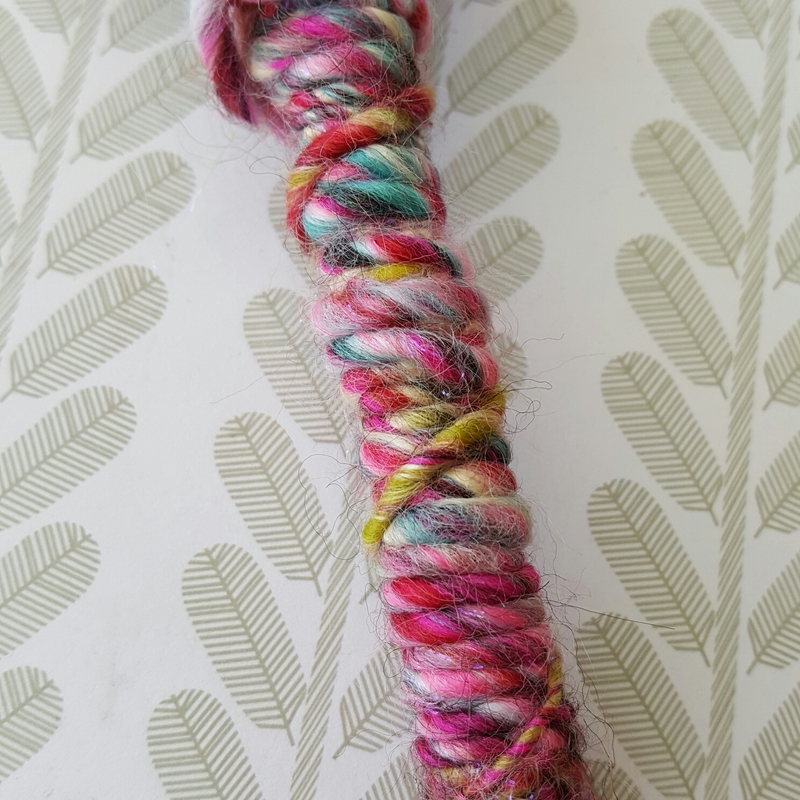 Fortunately for everyone, this post is about spinning yarn and not break dancing, though I’m sure my attempts at that would be fascinating too (and possible a lot funnier!) MrCraft made me a lovely drop spindle, as promised, and after watching a handful of YouTube videos I decided it was time to take the plunge and give it a whirl (sorry, awful pun). It was a very steep learning curve and I’m not sure that what I produced will be much use for making anything. However, the process was really interesting and quite good fun. The first thing I learned was preparation is key. 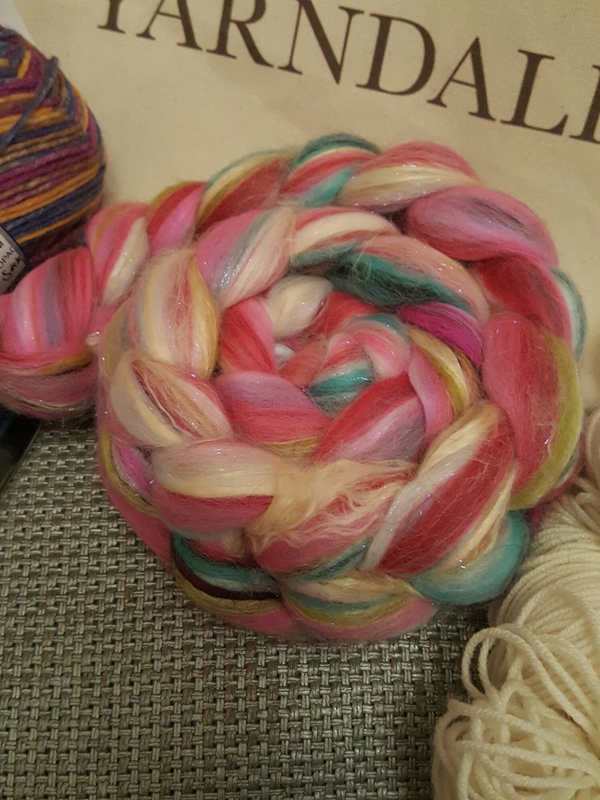 I know, that is really obvious, but I hadn’t realised just how much I needed on do to my beautifully braided roving before it could be spun. It was quite broad and needed breaking into narrower strips. Of course, being new to this I didn’t really know how narrow the strips needed to be so there was a lot of guesswork involved. Also, once I began to predraft it, the spinning process became much easier. The amount of spin you put on it seems to be quite hard to control too. Spin too much and you get a coil, spin too little and it looks fluffy. (Handy to know if you want either of those effects I guess?) The spinning part is a lot of fun though and it’s very easy to get carried away. I also discovered that you need to research it well before you start. I was merrily spinning yarn (unevenly) to the approximate thickness I wanted. It was then that I read about plying and learned that my yarn only needed to be half of that thickness so it could be plied. Whoops! I’m going to prepare the rest of my.roving to half of the thickness I’ve been using so that my next batch is better. The weight of the spindle matters. My fibre kept snapping when spinning and although it can be fixed, it got me thinking about why it was happening. Feeling a bit frustrated with my efforts so far I decided to borrow a book from the library, which contained a handy table of weights needed for the whorl (round bit of the spindle) to make different yarn weights. I’m going to show it to MrCraft as the spindle he made is fab but I suspect it is a bit too heavy for the yarn I’m trying to spin. Hopefully I’ll soon have a lighter spindle so I can carry on! Here’s my first go at spinning, varied thickness yarn is very trendy right now, isn’t it? Here’s a closer look, for the brave amongst you. The colours are very pretty, so hopefully when I have another go I will make a yarn worthy of using! I think you, and the yarn you’ve made, are absolutely BRILLIANT. To teach yourself anything at all is something I admire in anyone. But to teach yourself spinning, from You Tube Videos is outstanding and shows your dedication to learning something new, just for yourself, and to learn it in a way that is ‘yours’. I’m filled with such admiration of you right now. You really are brilliant. GREAT post too. A thoroughly good read from start to end. That is exciting! The lovely yarn you have now, and your custom made spindle! Wonderful! Hm. Well, firstly your supposed to let the singles rest on the spindle, though a lot of spinners disagree or are impatient and ply without letting them rest overnight. The other thing is, I guess, pinching the end of the single to keep it from unspinning (which I’m sure you’ve tried). If you chain ply the singles, pinching will work and they’ll untwist and balance out. If you’ve wound the single off into a center pull ball, the same thing will happen – just secure the yarn end to the spindle or wind on enough yarn to keep it stable. Once you ply all the singles, (or if you decide on a single ply), wind it off on a niddy noddy (easy to make one using PVC or dowels & copper plumbing connectors) to make a skein and finish it by washing it and whacking it – that will set the ply and/or the final twist in the yarn. I hope some of this makes sense; it’s hard to give advice without seeing what you’re doing. HTH! I second all the helpful comments above. I have no idea about any of this except, I think the colours are really, really yummy! Edible, in fact. well-I am impressed!Good for you! Well done. I believe it is quite a tricky art to master but you have done a great job for a first attempt. Thank you. I’ve had a second attempt that I am happier with and hoping I keep improving. What gorgeous colours. Braver than I. 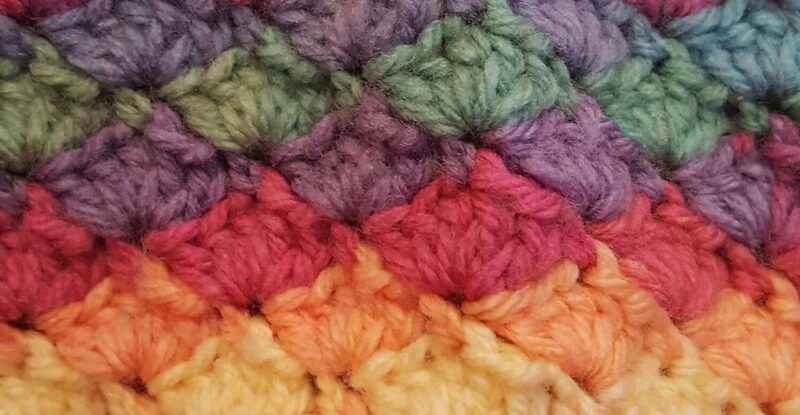 Do you have a project in mind for the finished spun yarn? That is fascinating! I should try this sometime. I love the colors of the yarns. Thank you, it’s totally addictive! Much better than the rope I spun as my first spin! Your first yarn is useable. I finally used my first yarn to knit a toy and it gave a really interesting texture to the finished piece. I started with a drop spindle, but quickly moved to a wheel. 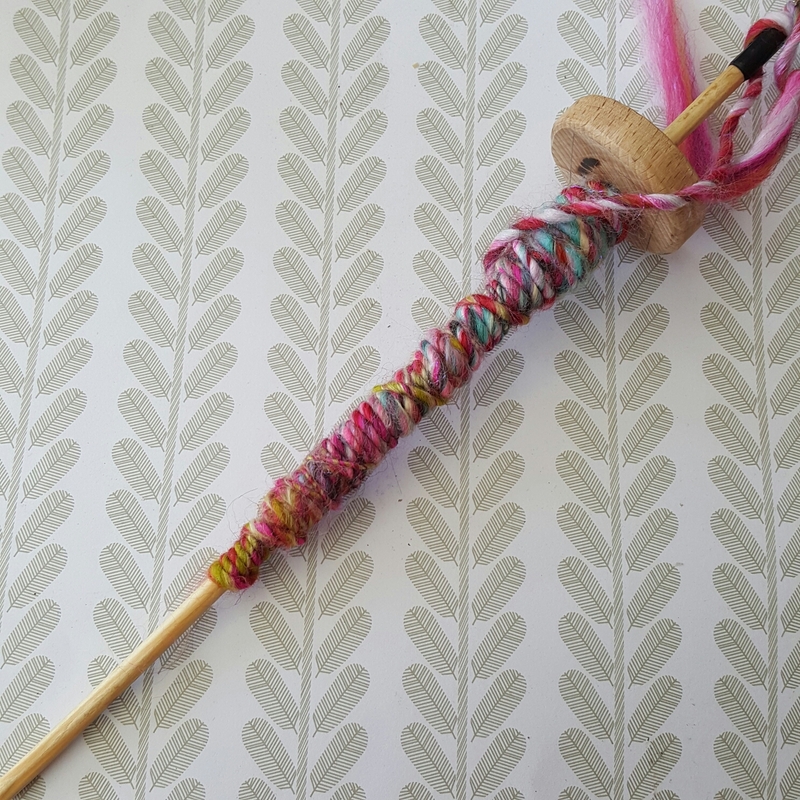 You might try a kick spindle, they are easy enough to make and give you both hands to work with the roving.